The temperatures are kinda crazy here in Ohio. One day it’s in the low 50’s, then the following day it’s in the 80’s. The heat has me realizing two very important things; One: I need a pedicure something fierce and Two: it’s time to stock with the freezer with homemade ice cold treats. What better way to chill out than with a Strawberry-Ricotta Popsicle? I completely forgot to put my Zoku in the freezer after the last time I used it, so I decided to make these popsicles the old school way – in a Dixie cup. 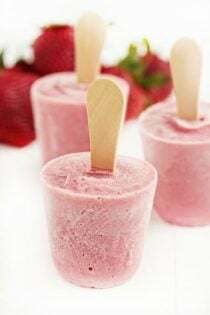 It really couldn’t be simpler, just pour your popsicle mix into the cups, cover the top of the cup with a small square of foil, insert your stick and freeze. I’ll admit it, I was a little leery about adding ricotta cheese to a popsicle; however the results were quite splendid. The blend of ripe, sweet berries mixed with tangy ricotta cheese creates a smooth and creamy popsicle that simply begs to be devoured on a hot Summer day. I can’t wait to play around with more ricotta infused popsicle recipes – I envision a lemon cream popsicle in my very near future! What’s you favorite cool summer treat? 1. Puree strawberries in a blender or food processor. Add ricotta cheese, sugar and lemon juice; blend or process 2 minutes. 2. Pour into freezer pop molds or 3 ounce plastic coated cups. Cover with pop mold tops or foil. Insert wooden sticks. Freeze 3 hours or until firm. Disclosure: This post is sponsored by Sargento.